Let’s flash back to November 22 for a moment. The Bucs were in Philadelphia, and turned in their best performance of the season, a 45-17 thrashing of the Eagles. Tampa Bay improved to 5-5, and was very much in the playoff hunt in the NFC. Today, the Buccaneers are 6-9, and will miss the playoffs for the ninth consecutive season. So what happened? Since that impressive performance at Lincoln Financial Field, the Bucs have dropped games to the Colts, Saints, Rams and Bears. We’re not talking Patriots, Panthers or Cardinals here. We’re talking about games that were winnable, and yet Lovie Smith’s team didn’t get the job done, aside from a victory over a Falcons’ team that just knocked off Carolina. The biggest disappointment down the stretch has arguably been the biggest one all season: the play of the defense. Now we know why Smith says he needs his defenders to force turnovers. When they don’t, the other team seems to march down the field at will, particularly through the air, regardless of whether the quarterback is Drew Brees or Case Keenum. The secondary is awful, regardless of who’s back there. There’s no question the suspension of Kwon Alexander hurts. But I can’t picture the loss of one player having that much of an impact. Tampa Bay is -4 in the turnover ratio. Somehow it feels worse than that. Over the past five games, the Bucs have forced a grand total of one takeaway. 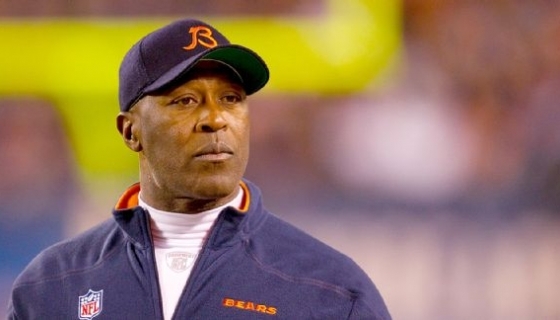 Should Lovie Smith be fired at the end of the season? I think he should, but my gut says he won’t. The team did triple its win total from a year ago. But consider this: Smith is calling the shots on defense this year, and I have seen absolutely no improvement in this unit from 2014. None. Smith is 8-23 in two seasons in Tampa. His predecessor, Greg Schiano, went 11-21 before receiving his pink slip. 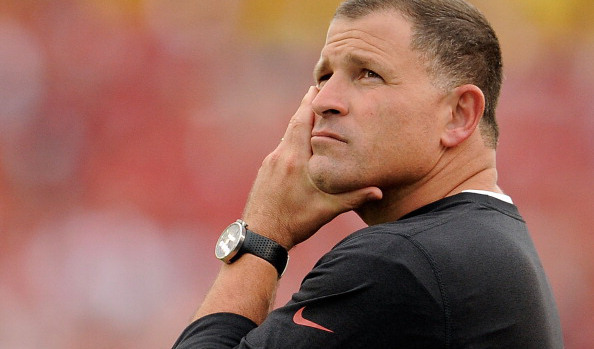 If Schiano got fired for that record, then why should Smith get a free pass? There’s a growing “rumbling” (for lack of a better term) on blogs and social media that the fans would like to see offensive coordinator Dirk Koetter promoted to head coach. He has done a nice job this year with an offense that includes a rookie quarterback, and Jameis Winston wouldn’t have to learn a entirely new offense. So why not give Koetter a shot? You’d keep the rhythm on offense, and it would allow them to give the other side of the ball a much-needed shakeup. There is talent on defense (Lavonte David for one) but the scheme is not working out. One final note: the Bucs’ season finale against Carolina is now scheduled for 4:25 p.m. instead of 1 p.m. Carolina is coming off its first loss of the year, and needs to win to clinch home-field advantage. Why can’t they just play the game at 1:00 and get the torture over with? The Buccaneers have mercifully made it to the bye week with a record of 1-5. Just about everything that could go wrong through the first six weeks, has. The Bucs rank dead last in scoring defense, allowing 34 points a game. Twice in the last month, they have been blown out, giving up 56 to Atlanta and 48 yesterday to Baltimore. They have given up a whopping 165 points in the past four games. They are worst in total yards allowed per game (422.) They have the second-worst pass defense, and are 25th when it comes to stopping the run. They’re not getting any pressure on the quarterback; they only have nine sacks through six games. I could go on, but you get the idea. Many fans are already calling for Lovie Smith’s head. That’s not going to happen to a first-year coach. But here’s a question: how does defensive coordinator Leslie Frazer still have a job? If I could only make one change during the bye week, it would be to send him packing. It wouldn’t fix all of the problems in Tampa, but it would at least send a message. It’s one thing to have a bad defense; it’s another thing for opposing teams to consistently run the ball down your throat, and for quarterbacks to play pitch-and-catch with wide-open receivers all day long, which is what we’ve seen so far in 2014. Lovie says he’s not changing his defensive scheme. Okay, then…. The offensive side of the ball is no better. The Buccaneers are ranked 28th in total offense. They have no running game whatsoever. Doug Martin, Bobby Rainey or anyone else who takes handoffs is not getting the job done. The offensive line has been awful in terms of opening holes or protecting the quarterback. Speaking of the QB position, I really think Mike Glennon is an adequate quarterback – not a superstar by a long shot, but not terrible, either. He’s thrown seven touchdowns compared to three interceptions. And consider this: he’s doing it with no running game or decent pass protection. His receivers often drop his passes. Anyway, he’s the best the Bucs have right now, so you might as well stick with him. While Smith won’t get fired this season (or so I think) he definitely needs to be held accountable for this mess. He brought in some high-profile defensive free agents during the offseason. That plan hasn’t worked out. If we, the fans, turned up the heat on Raheem Morris and Greg Schiano when they were on the sidelines, then we should absolutely treat Smith the same way. In the meantime, enjoy the bye week, knowing that Tampa Bay can’t lose next Sunday. The Buccaneers have a new head coach – and he’s someone very familiar to Tampa Bay fans. Welcome back to Tampa, Lovie. Lovie Smith was a defensive assistant assistant under Tony Dungy, so he knows how things used to be in Tampa when the Bucs had a nice run during the late 90’s and early 2000’s. Not only that, he has previous NFL head coaching experience – something Greg Schiano did not have. Smith took the Bears to the Super Bowl seven years ago, and was 81-63 in nine seasons in Chicago. In other words, he knows how to win. From a public relations perspective, this is a great move – one that I agree with 100%. Whether it translates into success on the field remains to be seen. Lovie’s staff is also starting to come into focus. According to ESPN, former Vikings’ head coach Leslie Frazier will be the Bucs’ new defensive coordinator, and former Cal coach Jeff Tedford will be running the offense. We’re still waiting to see who the Glazers will choose to be the new general manager. That will be the next big move they make. In the meantime, Smith will be formally introduced at a Monday afternoon news conference.